A family that makes and eats nankhatai together stays together. Resurrecting my mother’s and aunts’ recipe. Diwali, for my mother and her four siblings, wasn’t complete without a mountain of homemade snacks. The coffee table groaned with painstakingly rolled mathiyas, crispy chaklis, poha chivda, coconut-stuffed ghughras, shakkar paras, and cardamom-laced nankhatais. Preparations started a week in advance under the watchful eye of my maternal grandmother. Recipes were perfected — a vatki (steel bowl) of this, a pinch of that — and committed to memory. Two days before the festival, the sisters would wake up early in the morning to prepare the nankhatai dough. My grandmother’s recipe was simple and she used steel vatkis to measure the ingredients. Cardamom was mixed with powdered sugar until it became fragrant. The sugar was mixed with generous lashings of homemade ghee. Once the mixture was creamy and fluffy, maida and vanilla essence were added and kneaded into a crumbly, sweet-smelling dough. Forty years ago, my mother’s family didn’t have an oven. So my mother and her sisters would pop the dough into containers and hop onto the local train to go to a bakery, five stations north to Andheri, in Mumbai. No one from the family can remember where this bakery was, except that it wasn’t too far from the station. There they would line up with other home bakers waiting for their turn at the oven. My mother remembers this ritual with fondness — it was a time meant to be spent with her sisters, when they would chat, laugh and bond over one of their favourite foods. As they waited, they would tear off tiny pieces of cream-coloured dough and shape it into plump moons and lay it out on the massive aluminium trays provided by the bakery. A chironji was pressed to the center of the biscuit. The chironji, my mother said, added an almond-like flavour. When their turn came, the bakers would heft the aluminium trays into the industrial-sized oven, and in a matter of minutes the nankhatais would be ready to take home. When I asked for the family recipe, it came to me in bits and pieces – my mother remembered the process, one aunt remembered the amounts, and another knew what didn’t go in. I set about recreating it, swapping vatkis with measuring cups, until I had anankhatai recipe that my mother approved of. 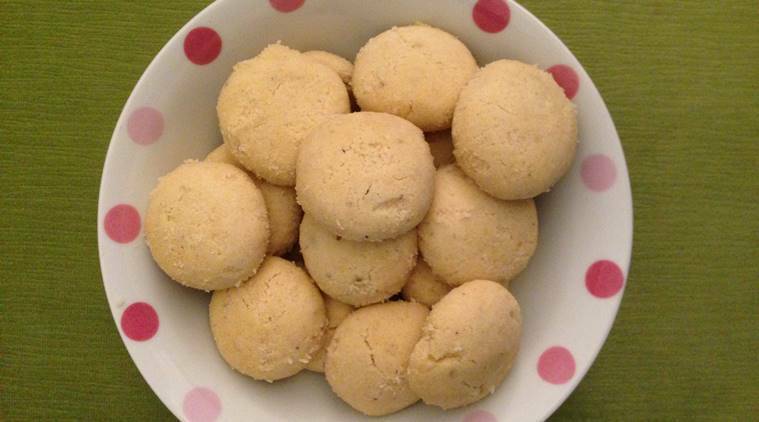 Most people when describing nankhatai call it an Indian version of the shortbread. I am not sure if I completely agree with that – the nankhatai is richer, flakier and more fragrant, the ghee adds a distinct flavour and texture. It’s crisp on the outside with a soft center that crumbles and melts in the mouth, releasing the sweet taste of cardamom. 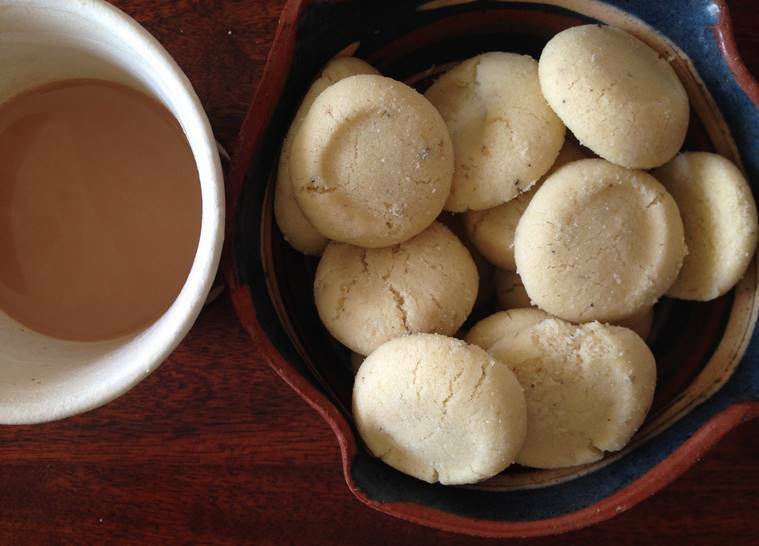 And, of course, the delicate biscuit is perfectly paired with a cup of masala chai. Method * Using your hands, rub in the cardamom powder with the sugar until it’s fragrant. * Now, add the ghee and mix until light and creamy. Add vanilla essence and mix well. * Sift the maida and add to the mixture. * Using your hands, knead the mixture into a slightly crumbly dough. * Shape the dough into tiny balls. * Flatten the biscuit slightly, and add a chironji or almond sliver to the centre. I couldn’t find any chironji in Bengaluru, and so went without. * Bake at 170 degrees for 15-18 minutes. When Bijal Vachharajani is not reading Harry Potter, she can be found looking for tigers in the jungles of India or baking in her tiny kitchen. In her spare time, she writes about sustainable development and is a consultant with Fairtrade Asia Pacific.